Dharma Sculpture is a quality conscious company that specializes in Buddhist sculpture from the Himalayas and southeast Asia, particularly Nepal, Cambodia, Indonesia and Myanmar. We look to purchase only the highest quality pieces for our online gallery. Today there is so much mass produced art that it is difficult to distinguish between quality, hand made pieces and mass produced icons. 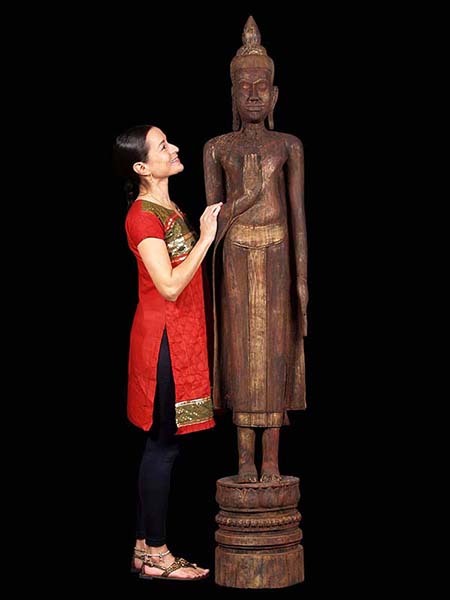 Every single one of our Nepalese, Cambodian, Indonesian and Burmese statues are carefully hand produced. We travel to Nepal, Cambodia, Bali, Java and Burma to meet and talk with the artisans and personally look at every piece with them and subsequently, selectively handpick each of our sculptures. This gives us unparalleled access to sculptures that otherwise travel through several other middlemen before reaching the consumer. Many times we ask the artisans to change particular aspects of the pieces that do not meet our approval. By inspecting each and every detail of every piece is the only way we can be sure that we are buying only the best quality pieces for our customers. This is our promise to you, that each and every statue will be of remarkable quality.